Regulators in California have temporarily suspended a Ford-owned transport start-up after its vehicles failed multiple inspections. 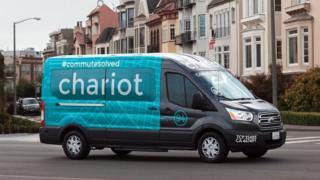 Chariot is a fleet of Ford Transit vans that ferry passengers along popular routes in San Francisco. In a note to users, Chariot said it expected to “resolve the disruption quickly”. Regulator the California Public Utility Commission (CPUC) said it had a responsibility to keep the public safe. Chariot has irked regulators in the city before. Earlier this month it was warned to stop mimicking - and congesting - routes already being offered by existing public transport. Chariot has been operating for more than three years and offers a monthly subscription for the short journeys, or one-off fares of $5 during peak hours. Ford bought the start-up in 2016 for an undisclosed sum, estimated to be in the region of $60m. Ford did not offer further comment on Thursday, referring the BBC to Chariot’s statement. The suspension was handed down by the CPUC, which oversees privately-owned companies offering infrastructure services, on Wednesday. Chariot informed its users on Thursday. It promised to reimburse customers who paid for the monthly service. When asked by the BBC, the CPUC would not confirm the exact reason behind the decision, other than to say the company’s vehicles fell short when inspected. "Yesterday we suspended Chariot’s TCP operating permit because Chariot did not pass three successive California Highway Patrol inspections,” said CPUC spokesman Christopher Chow. "The CPUC has a responsibility to suspend a carrier’s operating permit for failure to maintain a vehicle in safe operating mode, other violations related to transportation safety and/or failure to comply with the DMV’s employee Pull Notice Program." The Pull Notice Program is a scheme which enables the sharing of employee records between companies that hire drivers. Correction 20 October 2017: An earlier version of this article incorrectly cited Salon.com as the source of a quote about Chariot. Their quote was instead referring to Lyft Shuttle and has since been removed.